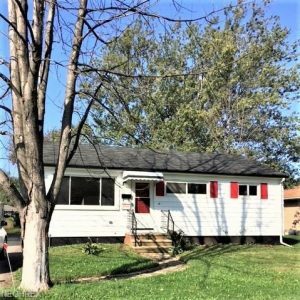 4754 Corduroy Rd, Mentor This charming ranch home with its freshly painted neutral décor welcomes you into the spacious Living Room opening to the Dining Room and brand new Kitchen! There’s also a fully remodeled Bath, new laminate flooring, carpet, light fixtures and more! The dining room opens to the covered back porch for your outdoor enjoyment. The full basement is complete with laundry, half bath, workshop area and ready to finish rec room. Updates include: 2018: Kitchen cabinets, countertops, flooring, Bath Vanity, tub, toilet, Sump pump, plumbing, new electrical panel, interior painting, light fixtures, Carpet & Laminate floors, Storm doors front and side & new railings, AC 2017, LR window 2016, newer windows, extra insulation and basement waterproofed. To view more visit our listing tab…………..